Many non-profits across Canada are looking to social enterprise as a way to support their social and financial mission. A major challenge posed for social enterprise is matching market demand to their product and service offering. Yet, within many large Canadian cities there are a number of potential customers with significant purchasing power. In particular, community housing providers can benefit from many of the same impacts by purchasing from social enterprises who have similar missions. This case study explores how Good Nature Groundskeeping, an employment-based social enterprise operated by Causeway Work Centre, a community economic development organization, worked with Ottawa Community Housing to embed a “value-added social enterprise” procurement component in the renewal of the OCH Procurement Policy when appropriate. 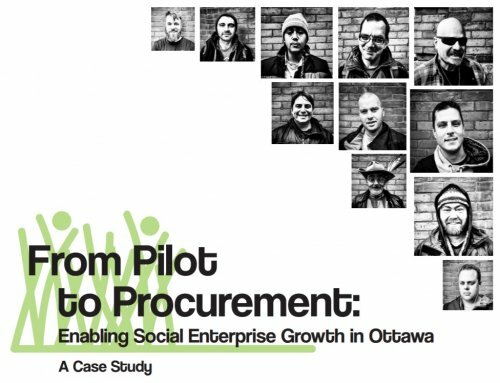 Experiences gained duing the three-year pilot supported the addition of the social procurement concept in a renewed version of OCH’s procurement policy. OCH had a portion of discretionary funding set aside for casual employees to perform some seasonal groundskeeping. This provided OCH with an opportunity to “try out” Good Nature Groundskeeping on a smaller scale without having to go to tender. Access to discretionary contract funding, or “set-aside” funding is important to support early-stage social enterprises, but a procurement policy that gives significant weight to social mission in addition to capacity and price has greater opportunities for scaling long-term social impact. Having a similar mission or intended impact is important for social enterprises and purchasers. However, offering a quality product or service at a competitive price is more important for long term impact. Ensuring that purchasing from a social enterprise meets your needs. To do so otherwise is not fiscally prudent and creates a less efficient form of charity.